Lion Corporation (President: Itsuo Hama) announces the release of Smile 40 Premium eye drops on Wednesday March 13, 2013, at pharmacies and drug stores nationwide. Containing 10 kinds of active ingredients including absorbable vitamin A, Smile 40 Premium is an effective ophthalmic remedy for alleviating eye fatigue and itchiness caused by prolonged use of the eyes and aging. The burden on eyes is increasing with the growing rate of Internet usage and more time spent using digital devices. Consequently, eye fatigue and itchiness are becoming more serious, especially for people in their 40s or older. Even among people in their 40s, the effect of aging on these discomforts gradually becomes obvious. According to a Lion survey conducted in 2012, respondents aged 45 to 49 were more likely than those between 40 and 44 to cite the effect of aging instead of prolonged use of the eyes as the main cause of eye fatigue (63% cited prolonged use and 81% cited aging compared to 67% and 60%, respectively, for those aged 40 to 44). Lion has also confirmed that eye drop users aged 40 and older look for products containing ingredients that are beneficial to the eyes when making purchases. In response to these findings, Lion is now releasing Smile 40 Premium eye drops. The 10 kinds of active ingredients contained in the product, including absorbable vitamin A, make it an effective ophthalmic remedy for alleviating eye fatigue and itchiness caused by prolonged use of the eyes and aging. 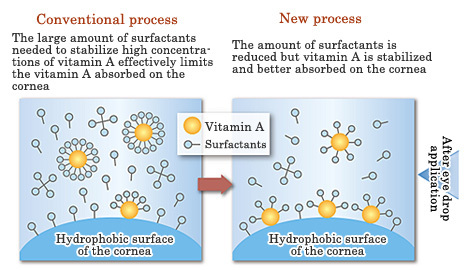 Vitamin A helps normalize the visual function and direct workings of the cornea. Because vitamin A is not readily water soluble, it is essential to infuse eye drops with vitamin A and stabilize it in liquid form. Furthermore, it is important for relatively large amounts of vitamin A to be absorbed on the cornea when the eye drops are applied. For Smile 40 Premium, Lion has utilized its newly developed technologies to stabilize vitamin A and infuse high concentrations in eye drops, while also realizing greater absorbability of vitamin A on the cornea. 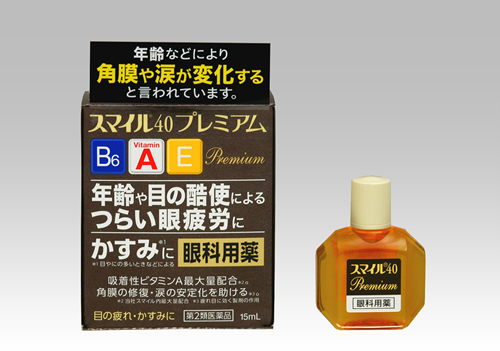 Smile 40 Premium contains the highest amount of vitamin A—35,000 IU —among eye drop products on the Japanese market. Vitamin E has been added to stabilize eye cell membranes through its antioxidant and blood-flow stimulation effects, and vitamin B6 has been added to facilitate metabolism of the eye cells. Taurine accelerates cell metabolism in the eyes, and potassium L-aspartate assists oxygen intake in the pupils. This ingredient relaxes the eyes by directly acting on the muscles that adjust the focus of the pupils, thereby alleviating symptoms of eye fatigue. Smile 40 Premium alleviates unpleasant symptoms such as itchy and bloodshot eyes through the anti-histaminic effect of chlorpheniramine maleate, the anti-hyperemic effect of tetrahydrozoline hydrochloride, and the anti-inflammatory effect of epsilon aminocaproic acid. One to three drops, three to six times per day is recommended. The volume of tears secreted decreases with age, and in the case of many older people, tears do not easily remain on the surface of the eyes. Consequently, as people’s eyes become dryer, essential nutrients and oxygen become insufficient, dust is not washed away from the surface of the eyes, and the eyes become more sensitive, resulting in fatigue. Due to age-related changes, objects come into focus at different distances. Seeing things at close range typically becomes more difficult, and the eyes become fatigued as they strain to adjust their focus. In another important function, tears contain vitamin A, which is essential for maintaining the life of the cells in the eye.